Historically, owning a diversified portfolio has produced attractive positive returns at a lower volatility as opposed to holding either an individual security or fund over the long run. That being said, be under no illusion, holding a properly diversified portfolio is hard. The above chart demonstrates how widely asset class performance can fluctuate from year to year which makes predicting the top performing asset class a largely fruitless task. At the very least it is one that requires more luck than skill! Alternatively, by holding a mix of these asset classes in an investment portfolio an investor can avoid the “all or nothing” approach and produce a smoother, less volatile return. Your overall portfolio performance will always be worse than your best performing asset class. It is natural to compare your portfolio to the best performer and therefore the returns will seem mediocre in comparison. You will always be worse than the star manager in the media, the best performing currency or individual security. You will always dislike something you hold in your portfolio. 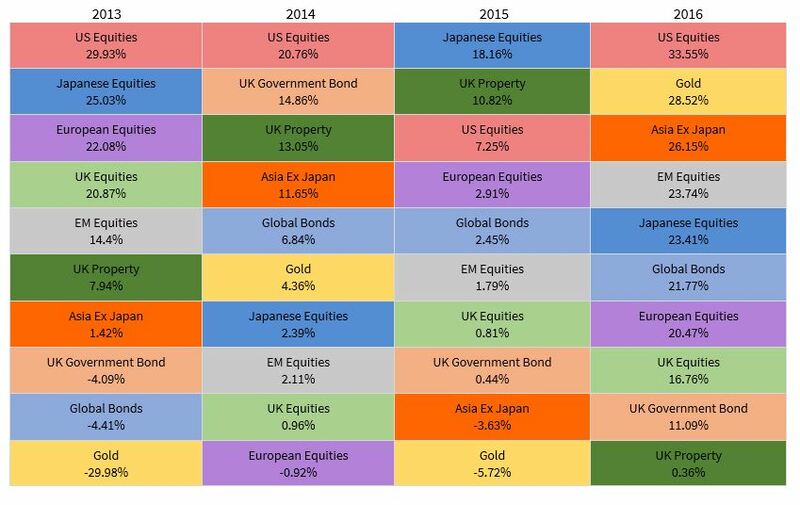 Take the year 2015 from above, you would have not been happy with gold and wished you had held more Japanese equities. Fast forward one year and gold returned 28%! You will always wish you had held more of the good stuff. Looking back, it is easy to say what you should or should not have held and you will always wish you held more of the best performing area of your portfolio – that is just human nature. The portion of your portfolio you love the most can quickly become the one you hate. The years 2013 and 2014 demonstrate this well. 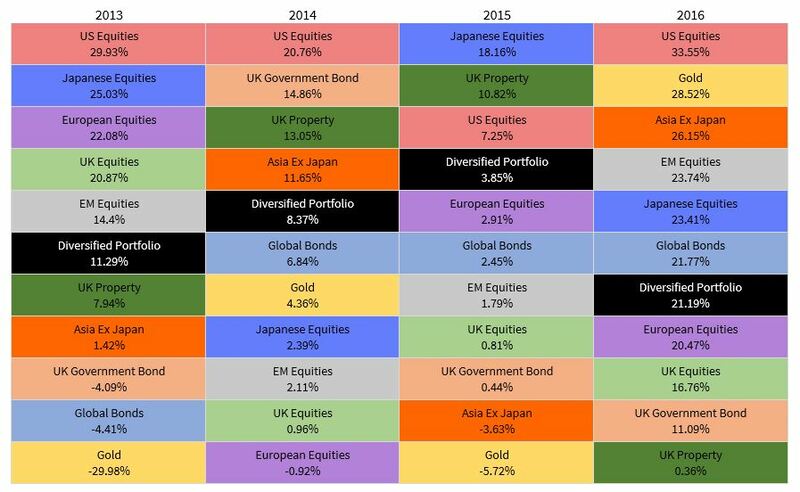 During 2013 European equities would have been a favourite in any diversified portfolio returning 22% that year. The following year however they were a negative contributor posting a disappointing performance of -0.92% and quickly falling down the list of favourite asset classes. For these reasons when holding a diversified portfolio, you will always want to tinker and chase performance, you will often convince yourself that your allocation is not quite right and you will lean towards chasing good performance especially when you think your strategy is not working. At Taylor Money we are aware of all of these factors and will instead help you to follow a disciplined approach by sticking to an appropriately diversified portfolio. We believe strongly in our investment process and though there might be points along the investment journey where small changes to allocations need to be made, we remain committed to our process and believe that being disciplined, rather than making changes based on short-term noise, will ultimately deliver the very best outcome for you. Unfortunately, picking the perfect portfolio that is guaranteed to outperform is only possible in hindsight. Instead, we focus on ensuring that your portfolio is suitable for your objectives and risk tolerance. By having a suitable portfolio and gaining an understanding of why you hold the various investments that you do, you are more likely to stick with your investment journey. Ultimately this will ensure that you participate in long-term growth wherever it occurs in the market, rather than switching or jumping out when short-term market weakness strikes. So how did a diversified portfolio perform? Annual total return in GBP based on calendar years. The returns from the diversified portfolio above is for illustrative purposes only. It does not take into account risk profile, the cost of investment, income, injections of capital or withdrawals made. As you would expect, performance is somewhere in the middle of all the asset classes. Yes you would have missed out on some of the big out performance but, most importantly, you also avoid some of the painful negative performance which could result in you abandoning your long-term strategy. General Disclosures: This research is for our clients only. This research is based on current public information that we consider reliable, but we do not represent it is accurate or complete, and it should not be relied on as such. The information, opinions, estimates and forecasts contained herein are as of the date hereof and are subject to change without prior notification. It does not constitute a personal recommendation or take into account the particular investment objectives, financial situations, or needs of individual clients. The price and value of investments referred to in this research and the income from them may fluctuate. Past performance is not a guide to future performance, future returns are not guaranteed, and a loss of original capital may occur.